Valentine's Day is a wonderful time to tell someone you truly care about them. When you give the gift of jewelry they can be reminded of your love throughout the whole year. It is Geoffrey Chaucer we must thank for the invention of St. Valentine's Day. In his book Parliament of Foules, circa 1380, he described this festival as the day on which every bird chooses its partner. William Shakespeare confirmed this by declaring that the feast of love was to be on February 14th because on that day the birds began to mate. Two strands of lustrous freshwater cultured pearls are paired together with a sterling silver double heart clasp. This adorable ring has little hearts going around in 10 karat yellow gold alternating with diamond filled hearts. Five sparkling diamonds are on this ring for a total weight of 0.03 Carat. Flaunting 36 gorgeous princess-cut diamonds, weighing a combined 1.75cts, this demure heart shaped necklace boasts an eye-catching invisible setting that creates a sea of ice and fire. A yellow gold surround encases these invisibly set princess-cut gems, framing them in glittering round brilliant-cut diamonds weighing a total 2.12cts. Marvel at the love imbued into every ounce of shimmering sterling silver in this toggle heart charm bracelet. Three stunning open hearts in 18k yellow, white, and rose gold hang freely together on a cable chain. A gleaming heart is crafted in 14 karat white gold and framed in shimmering gemstones. Crisp round diamonds and delicate pink sapphires alternate for a gracefully feminine look. Discover the unparalleled allure of February's birthstone with these wonderful 8mm checkerboard cut heart shaped amethyst gemstone drop earrings. Crafted in lustrous 14 karat white gold, these pieces also boast a small collection of 8 crisp diamonds to match. 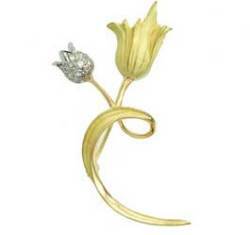 Easter is this weekend, and while this holiday is not one of the biggies for jewelry shopping, you'll still find plenty of Easter jewelry on the net. While I know Easter is actually a religious holiday, it is also a time that I think about my old pet rabbit, Mr. Bunny, a little dwarf rabbit who was with me for eleven years. So, this is in tribute to Mr. Bunny – lots of pretty bunny jewelry. Pictured first is a rabbit pendants from Zulu Moon, who seems to have a pretty good silver charm and jewelry bunny collection, including these sterling bunny post earrings. I also found some pewter bunny jewelry at the Bunny Bunch Boutique. 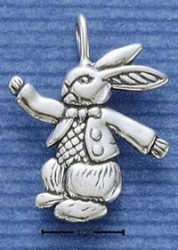 Here's also a sterling bunny charm on a chain from them. St. Patrick's Day is one of my favorite holidays for a few reasons. First, it is the official dating anniversary for my husband and me. I dump one guy and found another on the same day! Actually, I had dumped my old boyfriend for about the zillionth time and realized it was time to move on to this other guy who I had been trying not to get to close to since I wasn't technically single at the time. Another reason for loving this holiday is that March is often a month filled with changes and those are usually good changes, at least for me. So, I'm looking for some good luck jewelry to get lucky this month, and I found some great pieces over at Red Enevelope. 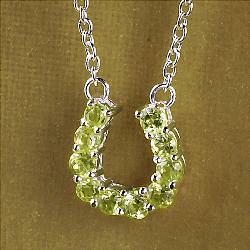 This sterling-silver necklace includes 10 peridot stones, said to promote happiness and good cheer. With the prongs pointing up, the horseshoe symbol is believed to retain good luck. Here's also a sterling silver bracelet: The native shamrock with three leaves is said to represent love, valor and wit.